Gamification is a marketing buzzword of late that involves using scoring and reward mechanics to encourage new users of a site or a piece of software to stay engaged. Foursquare is famous for offering badges for various activities, which promotes further use of their application. But gamification is not just for startups and mobile app developers. A recent visit to a MN charity showed how they use these tactics to engage new donors and to fulfill their mission of feeding children in need around the world. Feed My starving is a charity devoted to delivering nutritious, culturally acceptable meals to families in impoverished countries. In collaboration with food scientists at private companies they have developed a $1.32 packet of dry food that can feed 6 kids when cooked. FMSC buys the ingredients, fills the packets and ships them to partner charities across the globe, who ultimately deliver them to needy families. The game mechanics come into play during the packing stage. 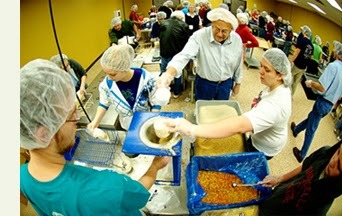 All of the food is packed by volunteers at one of their packing facilities in Minnesota, Illinois and Arizona. Everyone is divided up into teams, where they work to fill bags with the 4 ingredients, seal the bags and pack them into shipping boxes. It’s a great time and amazing how many meals a group can pack in an hour and a half. And it works! In a year the organization can ship over 120,000,000 meals with the help of 500,000+ volunteer packers and the food reliably arrives to those that need it. They have the highest possible rating at Charity Navigator. But why use people, strangers, to fill the bags at all? Wouldn’t it be more efficient to ask staff members to do it rather than train new groups for each shift? And there must be machines or at least measuring equipment that could help automate the task of filling plastic bags with a consistent amount of rice. I think the answer is that the benefits of gamification, especially the increased feeling of ownership amongst volunteers, outweighs the potential inefficiencies. While any contribution from a donor helps, it’s the long term partners that are really useful to a healthy charity. For any non-profit, it’s a challenge to get people involved and invested. Unfortunately donors are often asked to mail out checks and never hear from the organization about the results… until it’s time to ask for another check. Reward systems change that by offering measurement and feedback immediately. It’s clear from the moment you walk in as a volunteer that Feed My Starving Children has long term relationships in mind. Entering their facility you’re greeted by the staff and given a nice introduction to how the ministry works. Subtle scoring systems and rewards start from there. Volunteers are divided into teams and gather in the packing room around a station. By design, all the teams are in the same room with identical set ups, establishing a playing field for competition. Quietly, the staffers mention how many packs fit in a box and how many boxes a typical team can pack during a session. So the benchmarks have been established. The staff never tells volunteers to rush or to try to set packing records. But do offer tips on how to operate quickly (“hand signals can speed up re-supplies by a few seconds”) and they start the packing session in the same way a race might start. Ready, set, go. During the session, there is up-tempo music playing across the room’s speakers and the room gets loud with teams trying to communicate with each other. Of course some good-natured trash talking is included and teams start to shout out how many boxes they’ve finished. Each team is pitted against the rest and pretty soon there is singing, chanting and dancing going on as the ingredients fly. It’s super fun but very much about winning. Once a session is completed (after a count down of course) the groups gather back in the meeting room to hear the numbers. Staffers tally up the packs, boxes and palettes completed and share the results of that day’s session. 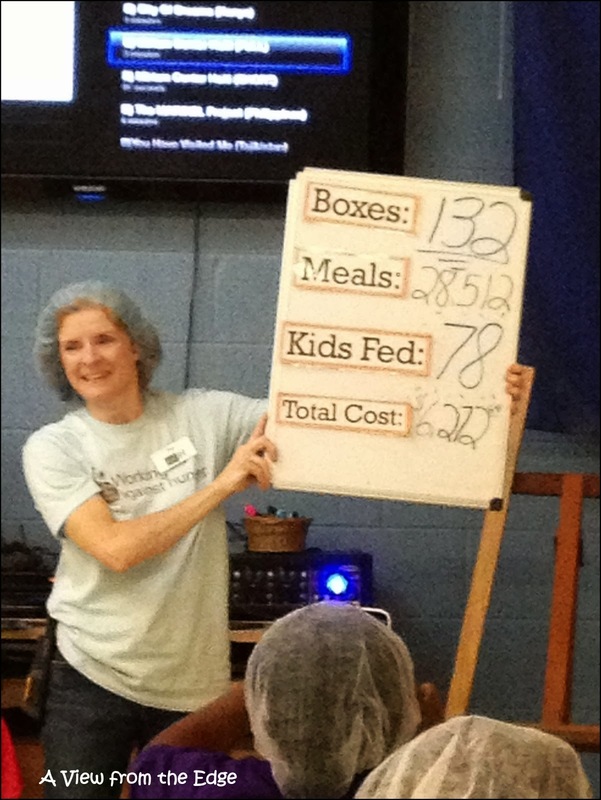 In all the times I’ve been to Feed My Starving Children to pack meals, I’ve always been assured that our group was phenomenal, much better than the average group’s output. Either I’m just that good or FMSC is using intangible rewards intentionally to give volunteers a sense of pride, ownership and some bragging rights. Finally volunteers are informed that all of the food they’ve packed has been paid for by the organization, costing hundreds of dollars. 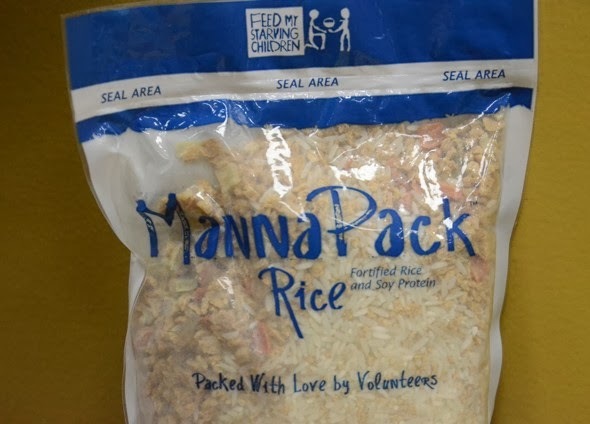 Previous donors have paid for the food packed in that session and FMSC needs more donations to enable future volunteer crews. The appeal is all very well done and guilt-free but it’s very persuasive, as I can personally attest to. In all, they’ve created a personal connection through a fun, competitive experience using game mechanics, which results in more volunteering, more donations and more word of mouth. This post is just one example! 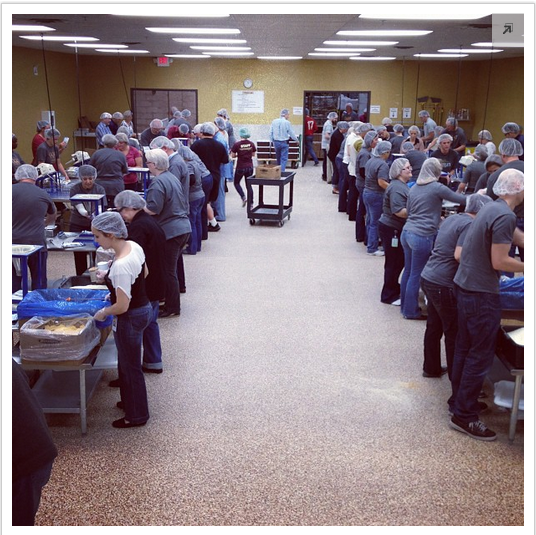 For more information on Feed My Starving Children visit fmsc.org and seriously consider bringing some friends and volunteering. It makes a great team building event, birthday or night out and you’ll be glad you did.